With 2018 well on its way we wanted to back and recognize how tremendous 2017 was year for Urban Core. As a backbone organization, we are extremely proud of everyone’s contributions and the degree of collaboration between our members – without whom all our great work would not be possible. One year ago, in January 2017 we kicked off the year with a brainstorming session that allowed us to look back on 2016 and celebrate what we accomplished, prioritize what we still wanted to complete, and explore new challenges that laid ahead. From the January planning session, we identified membership growth and collaboration to be a major priority in achieving Urban Core’s mission and vision. A new subcommittee was struck, Networking and Outreach that is focused on reviewing our memberships, rebuilding old relationships, and kindling new partnerships (that is a lot of ships). Through 2017 we saw one of our subcommittee, The Resource Hub’s hard work come to fruition with EMBERS being rewarded the contract to run a low barrier income generation hub to fill some of the gaps in service supporting people throughout the employment continuum. Planning is well on its way with staff being hired and doors set to open in early Spring. EMBERS has named their project: Eastside Works. We are grateful for the grant from the City of Vancouver that has allowed us to fund Ara’s role, which has been fundamental in supporting Urban Core, the Executive Committee, and all the Sub Committee’s work over the past year. Without this role and the tremendous work Ara has done it would not have been possible to be where we are today. In addition to Ara’s role with Urban Core, both EMBERS and Hastings Crossing BIA (HXBIA) are hosting LEDlab Project Coordinators (graduate students) to support the great work each organization is doing in collaboration with Urban Core. Austin is working with EMBERS to coordinate the launch of Eastside Works. David is working with HXBIA to build a sales pipeline for social enterprises. Both projects aim to build a stronger inclusive economy in the DTES that supports a full range of residents, businesses, and community engagement in the employment continuum.. Recently, Urban Core and Exchange: Inner City met with the Minister of Social Development and Poverty Reductions to highlight the amazing working happening in this community and to inform key issues in the Province’s Poverty Reduction Strategy. Going into 2018, we are really excited about our partnership with Exchange: Inner City as we work together towards building an inclusive economy in the Downtown Eastside. 2017 was a big year for us! Through meetings and events we’ve engaged over 300 people who bin to support their livelihood. Binners’ Project is a member-based initiative, with 84 active members (out of a total 137 meeting attendees). In the Spring, eight members stepped into leadership roles, meaning staff working as “Team Leads”. They coordinated our members to complete fee-for-service work and increase our capacity to deliver services. The work is part-time and flexible, and offers a gentle introduction to office-based work for people who are interested in learning more about this kind of work environment. Digna volunteered at Carnegie Community Centre from 2014 to 2017 doing kitchen preparation, dishwashing, and other volunteer roles in the Carnegie kitchen. During this time, she worked as a blueberry picker, and ran a corner store in her building in the Downtown Eastside. When Carnegie Centre received funding to support low-barrier paid dish-washing positions in the kitchen in 2017, Digna was one of the first volunteers to apply for a job! Digna now works approximately 20 hours per week for the City of Vancouver doing kitchen preparation, baking, and dish-washing – all skills she built upon through her volunteer work. In addition to working at Carnegie Centre and volunteering with Lookout Society, Digna has been attending Vancouver Community College to complete a certificate in Office Management, and is working on starting a home-based business. Claude has been living in Metro Vancouver since 1994. When he began volunteering at Carnegie Centre in 2013, he had recently moved to the Downtown Eastside after a period of homelessness. Claude was struck by how kind, tolerant and patient the staff and volunteers at the Centre were. 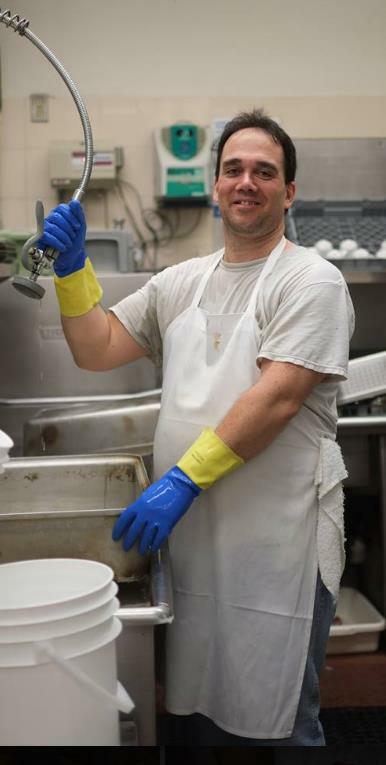 Even though he had no prior experience in the food service industry, through volunteering as a dishwasher, kitchen preparation helper, and server, Claude learned a wide range of on-the-job kitchen skills. He was hired by the City of Vancouver as a cashier in 2014, and now works an average of 20 hours per week as a cashier, cook, and dishwasher in the Carnegie kitchen. He’s ready and able to jump into other positions as the team needs him. Claude still lives in the Downtown Eastside, and really enjoys being part of the centre as he likes working with other staff and volunteers to give back to his community. Jessica, born and raised in Vancouver, is a self-taught handcrafter. After moving away for many years, she came back to BC in 2014. She first tried her hand at vending in a local park, but couldn’t afford a vending permit so had a hard time selling her handicrafts. 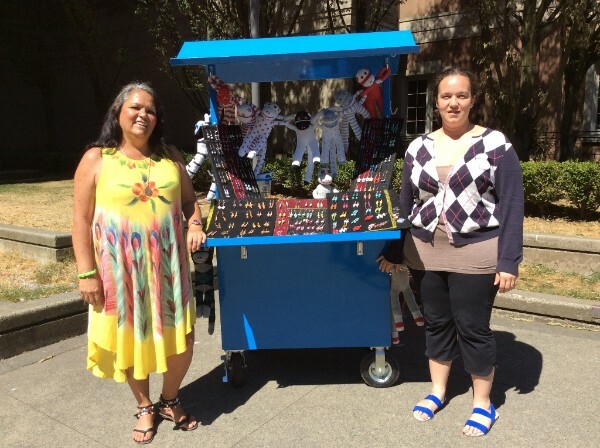 As a member of the Street Vendors Collective, a pilot initiative supporting the City of Vancouver’s Downtown Eastside Community Economic Development strategy, she sells jewellery, sock monkeys, afghan blankets, and other hand-made items. One of the most challenging things about her current schedule of vending a few times per week is that income is inconsistent depending on the weather, vending location, or the season. She’d like to learn some new technical skills, so she can build a stronger online presence so that she can attract new customers. One of the things she likes most about legal vending and participating in the Street Vendors Collective is that it gets her handicrafts, which she creates with love and “a little part of herself in each item,” out into the world. Tim is originally from Ontario, and has been living in Vancouver for over 30 years. He vends two or three days per week as a means for survival, because his regular monthly income barely covers his rent and bills. Before joining the Street Vendors Collective, he vended at a few other street and flea markets in the downtown area, but found it hard to make money because not everyone could afford to pay what it cost him to produce his crafts. 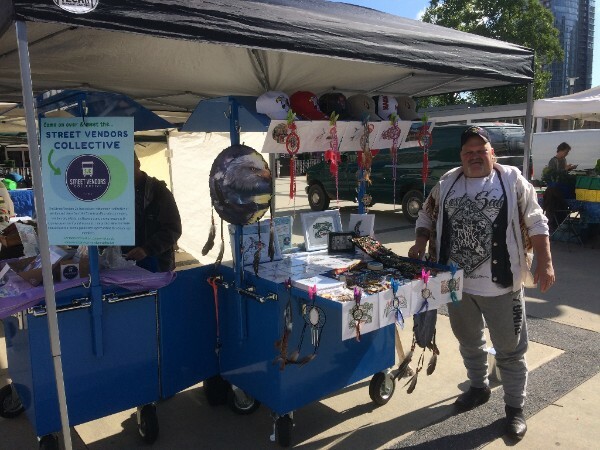 He notes that the legal vending opportunities and organized events have helped him tap into new client bases, which has helped him earn more money vending. Moving forward, he’d like to work on some business planning skills, such as costing and pricing his items to reflect the hard work and time that goes into making them. Last year, LEDlab continued their social enterprise incubation program working with community partners ReBuild, The Binners’ Project, Hives for Humanity, and Knack. They also supported a listening project to better understand the needs of low income entrepreneurs and makers. The outcomes from these projects are listed in detail in their annual report. Outside of LEDLab’s annual cohort program, they work with a wide network of civic and community partners to identify barriers and potential solutions for systemic innovation. 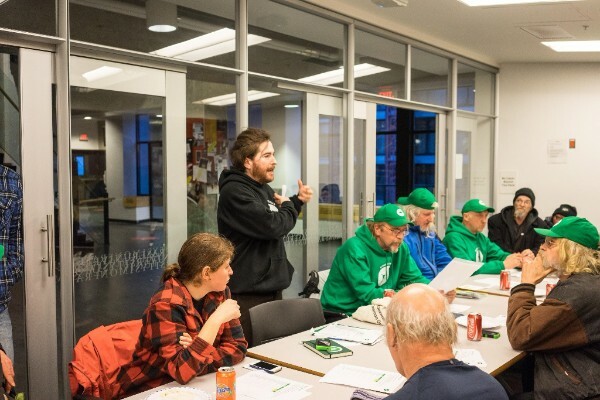 LEDLab worked closely with the City of Vancouver and more than 30 businesses, residents, and organizations to facilitate the co-creation of the DTES Community Economic Development (CED) Strategy. We also partnered with Potluck Cafe on an income assistance policy research project to surface legislative barriers to social hiring and are engaging with the Ministry of Social Development and Social Innovation about potential solutions.